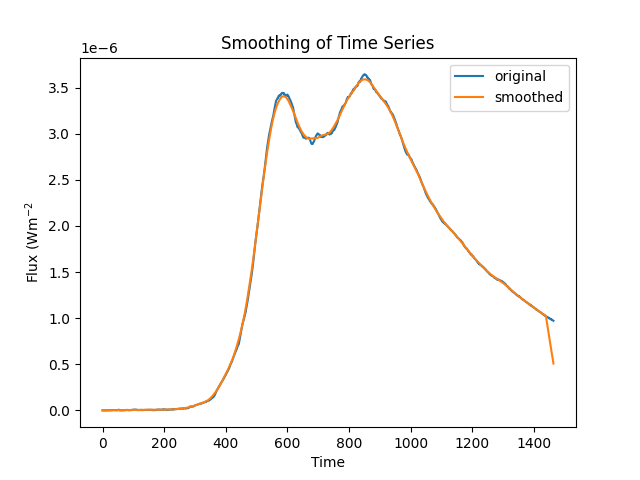 This example illustrates smoothing a TimeSeries using a convolution filter kernel from convolution and convolve function. Now we will extract data values from the TimeSeries and apply a BoxCar filter to get smooth data. Boxcar smoothing is equivalent to taking our signal and using it to make a new signal where each element is the average of w adjacent elements. Here we will use AstroPy’s convolve function with a “boxcar” kernel of width w = 10.